The well-dressed patrons of Broadway's evening thoroughfare likely expected to be wowed and dazzled by any number of eateries, cabarets or simply the neon lit spectacle. Slugs from automatic shotguns? The unmistakable scent of gunpowder? A wildly out of control car chase? No, these were not what visitors foresaw, but a loud outdoor show they most certainly did get, and it ended with bloody collateral damage. On May 25th, 1933, As people were filtering in and out of various establishments around Manhattan's 80th and 81st street, two sedans raced by (one report claimed three vehicles were involved), with one vehicle's occupants visibly the aggressor, firing high-powered shotguns and/or machine guns at the other. The gun battling pursuit, though short-lived, ended when the presumed dominant car sped off east on 81st while the bullet-ridden loser vehicle crashed into a fence on 84th. All of the firefight participants escaped - including two bloodied, limping mobsters who fled the wrecked vehicle. 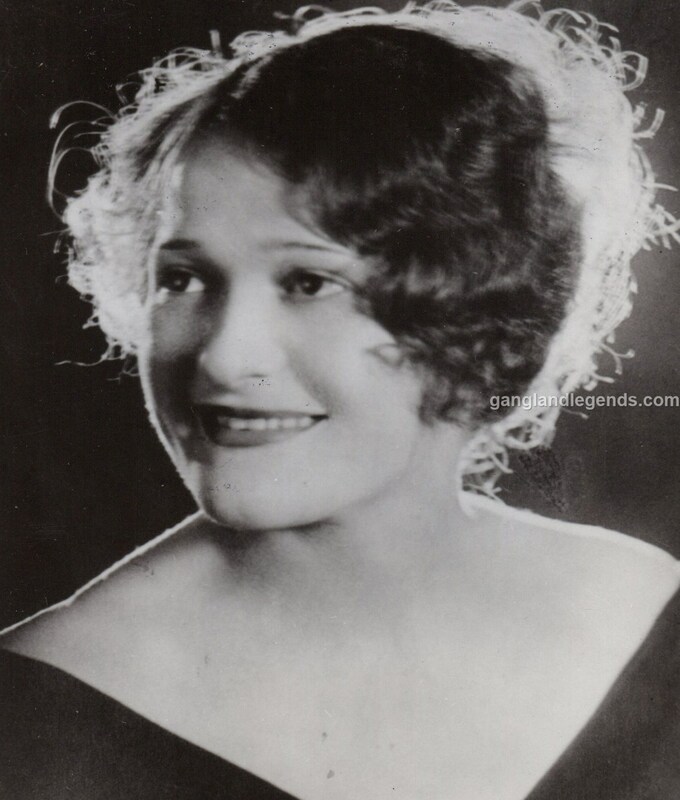 The shooting, however, put three of four civilian victims in the hospital: Irene Savage, 24, took a bullet in the shoulder, Walter O' Donald, a visiting shopper from Hornell New York, suffered a presumed minor scalp grazing via shotgun slug, Sadie Fontine, 45, suffered the worst injuries, hit directly with a bullet in the back and shrapnel in her hips. Edward Safern, whose car was struck by stray bullets, suffered no physical injuries. 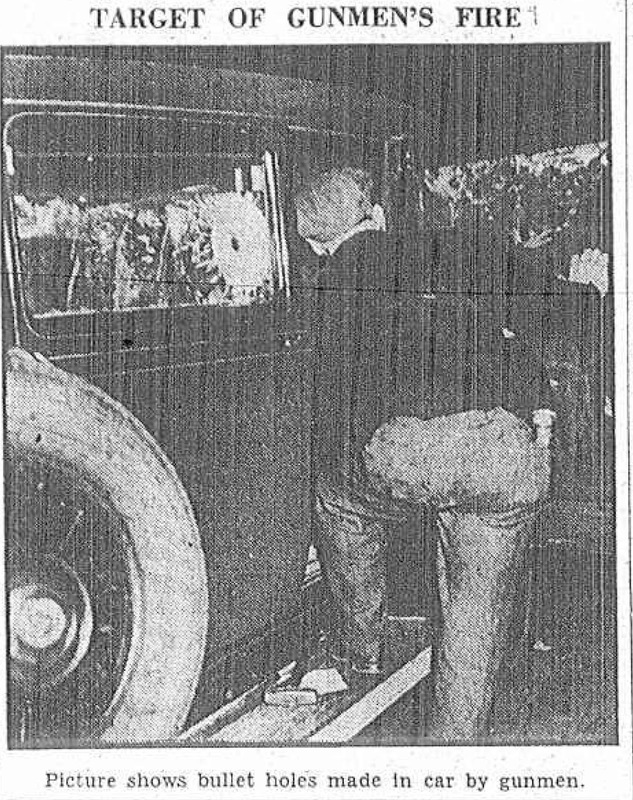 Despite plenty of witnesses the only physical evidence retrieved from the scene - blood throughout the crashed car, two pearl colored fedoras with New Jersey haberdashery labels, car registration to an 'Edward Rosen' of the Bronx, and the inch think glass of the vehicle windshield. The thick car windows were obviously intentional 'bullet proofing' (though proved a failure against the high powered rounds), the hats helped in the police theory that a bootlegging war involving Irving Wexler, aka Waxey Gordon could be the motive, but upon following up the registration lead... it appeared Edward Rosen was a manufactured name, and the vehicle didn't belong to anyone at the given address in the Bronx. "As police locked the trio up, they announced they had definite information that a beer war between Gordon and two men whom they named as Louis "Lefty" Buckhalter and Charles Luciano, has been ended by a truce." - Associated Press, September 1, 1933. It took a few months for all the puzzle pieces to fall into place, climaxing when police pinned charges on Charles 'Chink' Sherman, his brother Henry, and Jack Weinstein. The trio had already been in custody for other weapons and narcotics charges, and were noted as being "the few remaining members of the Waxey Gordon Gang." Although the three men denied any participation in the May 25th shootings, information led police to identify two other involved individuals, both of whom carrying reputations known to certain law enforcement entities, yet not very familiar to the larger public. Louis 'Lepke' Buchalter and Charles Luciano. Indeed, in 1933 neither man was a household name, but within the underworld they possessed quite a resume and status. Waxey Gordon, once allied with Luciano, Lepke, Meyer Lansky, and so on, had been losing favor with the group and feuds erupted between the factions, which included Dutch Schultz who, at the time, was in good graces with the likes of Luciano. Some theorize it was Meyer Lansky who filtered tips to police that eventually put Gordon away on narcotics charges. In any case, Gordon was in jail, several allies had been murdered both in New York and Los Angeles, and 'Chink' Sherman's fate would be far worse than that of the innocent bystanders caught in his gang's fusillade. 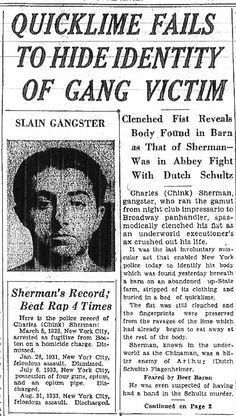 Sherman, who had bad blood with Dutch Schultz dating back to knife and gunfights in 1931, met the grim reaper in 1935. His body... discovered in a shallow lime pit within a barn in Monticello New York. Sherman had been shot in the arm, his skull showed a bullet wound and that of a blow from a fire axe, presumably. The property where the body was found belonged to the Drucker family. It took another five years before the connection was made that Sherman's grave was one of several in the region, and that one of the property owners - Jack Drucker - served as an icepick wielding member of Murder Inc. The greater gangland irony - Schultz, who also eventually fell out good graces with the fellas, was gunned down by Murder Inc. henchmen barely two weeks before Chink Sherman got whacked. 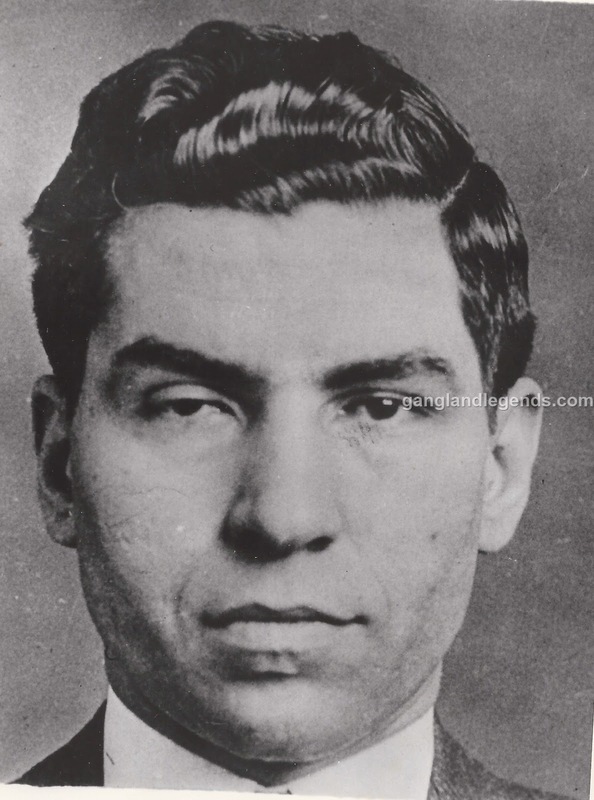 Further, 1935 was also the year that Charles Luciano's name escalated into public recognition, having made much larger headlines in regard to theories of who may have ordered the Dutch Schultz murder. AP. "Gang Gunners Hit Two Women On Broadway." Geneva Daily Times. 25 May 1933. P.3. "Auto Gun Duel Injuring Three Laid to Beer Feud." Brooklyn Daily Eagle. 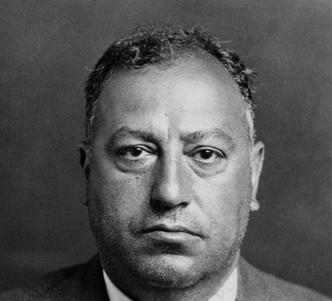 25 May 1933. P. 8. Cipollini, Christian. "Lucky Luciano: Mysterious Tales of a Gangland Legend." Strategic Media Books. 2014. AP. "Sherman, One of Few Left Of Gordon's Gang, Nabbed." Buffalo Courier Express. 1 September 1933. P. 3.